The AP-IBR350 Double-Cell/LTE Kiosk Antenna is an all-in-one, low profile housing with 2 Multiple-In, Multiple-Out (MIMO) high gain Cellular/LTE antennas inside that is used with the Cradlepoint Wireless Router to provide the fastest data throughput speeds and enhance the cellular signal. 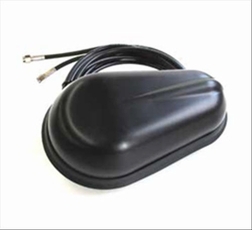 This is typically used on kiosks, vending machines, digital signage and other machine to machine applications requiring a small, covert antenna to get the signal outside of the metal enclosure. Get Beyond the Wireless Shield With Kiosks and Digital Signs, the first hurdle to address is getting the wireless signal outside of the enclosure where the modem resides. Our antenna is mounted on the outside of your hardware, thereby providing a much better signal Bigger Cellular Footprint The AP-IBR350 Double Cell/LTE Kiosk Antenna can provide up to 25% more wireless coverage, depending on the geography that it is used in. We use an omnidirectional pattern and apply a 3 dBii gain to our antenna which focuses the energy of the antenna to the horizon, where cellular towers are.